The Cathedral pipe organ was built and installed by the Austin Organ Company in 1965, under supervision of then Organist/Choirmaster, Robert Setzer. This organ consisted of 3 manuals, 61 ranks of pipes located in 6 divisions. The pipes range in size from 16 feet long (located horizontally under the St. Peter’s window), to pipes smaller than a pencil. In 1997, a new four manual organ console and digital ranks were added by the Rodgers Organ Company under the supervision of Organist/Choirmaster Roberta Poellein. Recent work by the Patrick J. Murphy & Associates in 2016 included a new Antiphonal division (retaining one rank from the original 1915 Austin pipe organ), a complete revoicing of the Great and Pedal divisions, moving the original Trompette en Chamade on the cathedral arch to the Antiphonal, and increasing the number of ranks to 64. In January 2019 a new organ console will be installed by RJ Rusczyk & Associates, LLC, with a complete tonal refinishing of the instrument completed in the summer of 2019. You can see the complete specifications here. The new organ console was set in place on February 21 and we expect that some or all of the organ will be operational by March 3. The organ console is the cabinet and the operating system in it — the keyboard, the stops, the couplers, and the computers — that create the sound when Music Director Dwight Thomas sits down on the bench on Sunday mornings. If you’ve been around the Cathedral recently during the week, you’ve seen the area around the altar draped in plastic to contain dust and dirt. (We remove the plastic for weekend worship.) 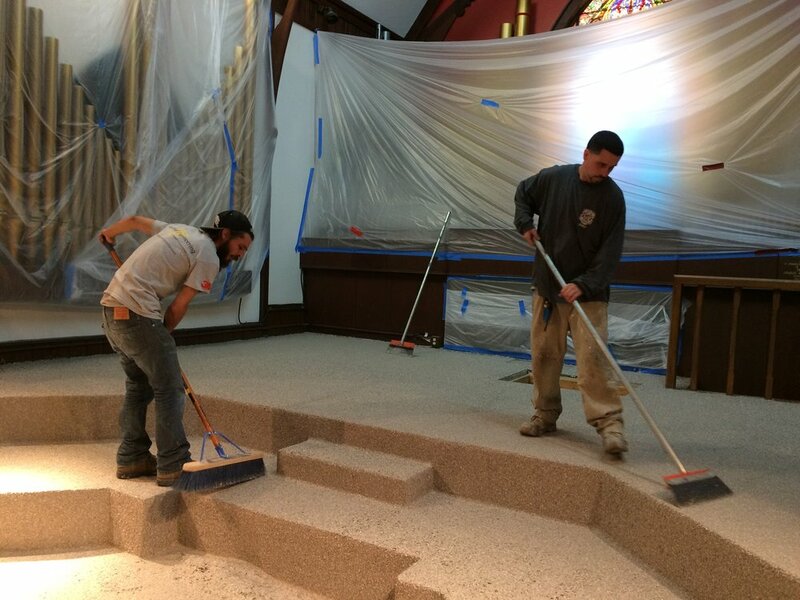 The work includes new flooring. Several layers of a non-slip, long-lasting epoxy coating were applied over the original tiles to fill in cracks and seams and create a smooth surface. Then workers scraped up loose bits before a final satin-finish top coat was applied. The finished floor has a flake appearance that resembles terrazo. If all goes as we expect, we’ll have great organ music and the Cathedral Choir will be back for a glorious service on the Last Sunday After the Epiphany, March 3. This is typically a major festive service with great music before we begin our subdued Lenten observance on Ash Wednesday. The organ console — the cabinet and everything in it — will be replaced to give the Cathedral a reliable, long-lived instrument with musical capabilities beyond what we have now. Coming up early 2019: a new organ console. The organ console is the cabinet and the operating system in it — the keyboard, the stops, the couplers, and the computers — that create the sound when Music Director Dwight Thomas sits down on the bench on Sunday mornings. "Two years ago the organ was struck by lightning," Dwight said, "and was out of commission for a couple of weeks. This year, on Maundy Thursday, the organ ceased to function because of frayed cables. We were able to quickly patch it back together so we'd have an organ for Easter, but those two events were a wake-up call that the console is in unreliable condition. The organ is an integral part of our worship and we need one that we can rely on." Ordinarily it takes 12 to 18 months to design, manufacture, and install a new console. We are intending to do this in just nine months, thanks to consultation and oversight from Bob Rusczyk of Clearwater, a longtime leader in the organ industry. He is the former president of Organ Supply Industries, widely regarded nationally as the go-to company for all things organ-related. "We want the organ to be installed, tested, and ready to go when the Cathedral hosts the North American Deans Conference next May," Dean Morris said. That event will draw about 70 cathedral deans and their spouses here May 2-5 for continuing education, fellowship, and worship. Installation will begin the third week of January 2019 and will take about four weeks. During that time we'll use alternative sources of music, as we did in the summer of 2016, when the organ pipes were removed, cleaned, retuned, and painted. The current operating system, installed in 1997, has become obsolete in the last 20 years. At the moment, our organ has a limited range of what it can do, simply because we don't have enough space to accommodate additional pipework. The new system will include digital augmentation that expands the range of what the organ can do. Unrestricted bequests will be used to pay for the cost of the new console.